I didn’t get a chance to post this on the 29th, but Happy Birthday Cooper! He’s six now! 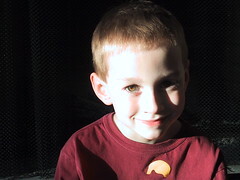 I can’t believe it’s been six years and – I’m sorry that it’s a cliche – how fast he’s grown up! Cooper and Eli? Do you have a Peyton, too? Indianapolis Colts’ quarterback Peyton Manning has two brothers, Cooper and Eli. Next Next post: And Eli is 3!